Charlie’s Tropic would not be possible without the many hardworking men and women who come to work with us every day. One of the people who helps keep our wheels turning is Chris Johnson our comfort specialist. The role of our comfort specialist is to find even better installation practices for us to implement into our work. The innovative operations we perform wouldn’t come to fruition without Chris spearheading our path forward. He always puts the customers needs first and works hard to find the proper solution to meet any specific requests. But what really Drives Chris? Chris knows that life is not all about work. What really matters to him is being able to kick back, relax and build relationships with those around him. Growing up, he spent quality time with his dad on the golf course, resulting in his true passion for the sport. Through their bonding time, he gained a deeper insight into what’s important in life. Morning, afternoon or night, there’s not a time when he doesn’t desire to get out and play a round of golf. As a father himself, he hopes that one day he can share all the lessons he learned from his father with his own young children. That is to say preferably on the golf course. His children, 8 and 3 years old, push him to always do better both at work and at home. Since becoming a father, his priorities have shifted and he lives out each day for the overall betterment of his family. This is so important to us at Charlie’s Tropic. We too focus each day on doing what’s best for our family, customers and employees alike. Chris’ role at Charlie’s Tropic allows him to bring his approach to life and to our customers as well. Every day he comes to work with the goal to make sure everyone is taken care of, including both our customers and his colleagues. Upgrading our products and the way we do things at Charlie’s Tropic is not only for the consumer’s benefit. It also helps our employees enjoy their working experience that much more. The progression we’re undergoing to be able to offer better products and services is unending. There’s no limit to the extent we will go to provide quality service to everyone we do business with. Chris knows the value of being able to look past the stresses in life and focus on what really matters. 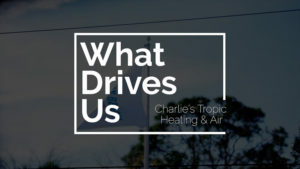 He hopes every customer of Charlie’s Tropic can live a better life too by finding solutions to their HVAC needs. Above all, allowing them to completely focus on the real joys in life. Check out another story on Chris here.